"An encounter can be a chance meeting, a planned get-together or even a confrontation. This collection of stories, non-fiction and poems features a variety of foreign encounters: with family, friends, lovers, animals, cultures, or just with one`s own prejudices and preconceptions. All proceeds from the sale of Foreign Encounters will be donated to Books Abroad." All the authors in this anthology are ex-pats or former ex-pats who live all around the world. All the work of submitting stories, editing, and publishing was done on-line. But here's the really fun part. Vanessa, who has two pieces in this year's anthology, is hosting a book launch party on November 10th! There are 7 contributors living in our general area who will be present. If you're interested in purchasing a copy of Foreign Encounters, just click on any of the Lulu links, and you'll be taken directly to the order page. If you are somewhere other than France, scroll down to the very bottom of the page. There you'll find a place to select your country of preference. You can then use that currency for purchase. Happy reading! Look forward to seeing you at the launch on 10th November. Tell all your friends about it!! WritersAbroad what a fantastic blog to be part of Evelyn and such a great idea for creative souls to connect congratulations on being published I am sure there will be some excellent work submitted for the Foreign Encounters theme, good luck. 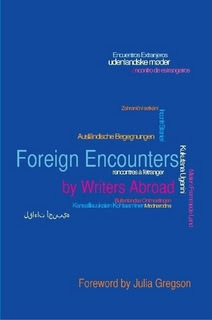 I'm a fellow contributor to "Foreign Encounter" - Rebecca Hall & my story was Greece's Nine Lives. I'm making my way slowly through the book and just read yours. I wanted to say I loved it and it made me smile: a real insight into human nature.